At Fitter Feet For Life we offer Gait Analysis for children which allows us to see foot, ankle, knee, hip and back alignment in slow motion. This helps us to assess abnormal posture, and so determine how best to correct it. Fitter Feet For Life can provide advice on selection of footwear, or, if appropriate, prescribe foot orthoses (orthotics) for children. Flat feet may be completely pain free, but falling arches can have a bad effect on the movements in the joints in the ball of the foot creating problems such as Bunions and Hammer Toes. The falling arch causes some tendons to work harder and can lead to tendonitis in the Achilles tendon at the back of the ankle and in other tendons around the ankle that try to keep the flat foot in a normal position for walking. Flat footed children may have problems after running, or they may not enjoy walking. They can experience pains or cramping in their legs and feet. They may find shoes are uncomfortable to wear as it is more difficult to find good fitting shoes for flat feet. Children should have their feet and legs examined at Fitter Feet for life if they experience any difficulty playing sports or walking. The heel bone has a large growth plate so when a child grows the bone gets bigger. As the bone approaches an adult size the growth plate closes. The bone developing at the growth plate in children is weak and cannot withstand repetitive stress so inflammation is seen particular in children who do a lot of sport or who are heavier in weight. If the heel alignment is poor, sloping rather than vertical, or if a flat foot is present, tendons around the heel can be painful. Nails can become ingrown during teenage development or just from kicking a ball or running. Tight shoes or socks, or incorrect nail trimming can also cause of ingrown toenails in children, although sometimes the tendency for nails to curve inward is inherited. When the nail breaks the skin, serious infections can result. Parents should never try to dig the nail out at home. A Fitter Feet Podiatrist can remove a small portion of the nail to help it heal and provide antibiotics. If an infection is present, phone us for an appointment. Our caring staff will look after you. Warts and Verrucae can develop anywhere on the foot, often they are on the bottom of the foot and can be painful to walk on. They are caused by the human papilloma virus, the same virus that causes warts on other parts of the body. Fitter feet provide freezing treatments, laser treatments for well established large verrucae and chemical treatments for younger children. We will advise you which treatment is best for your type of Verrucae. Just book a free assessment to find out more. Your Kids Can’t Keep Up with Their Friends. If children don't enjoy sports or running around in play, it may be because their feet or legs are tired. Fatigue and aching is common when children have flat feet. The muscles in the feet and legs tire easily because the feet are not functioning as well as they should. Children stop doing activities they usually enjoy. If they are reluctant to participate, it may be due to heel pain. This is a problem often seen in children between the ages of 8 and 14. Repetitive stress from sports may cause muscle strain and inflammation of the growth plate, a weak area at the back of a child’s heel. Children may feel pain or notice a change in the appearance of their feet or nails but don’t tell their parents because they fear a trip to the Podiatrist. Parents should make a habit of inspecting their child’s feet at a young age. Look for any changes such as calluses, growths, skin discolouration, or redness and swelling around the toenails. Clumsiness with tripping and frequent falling may be a sign of in-toeing, balance problems or neuromuscular conditions. 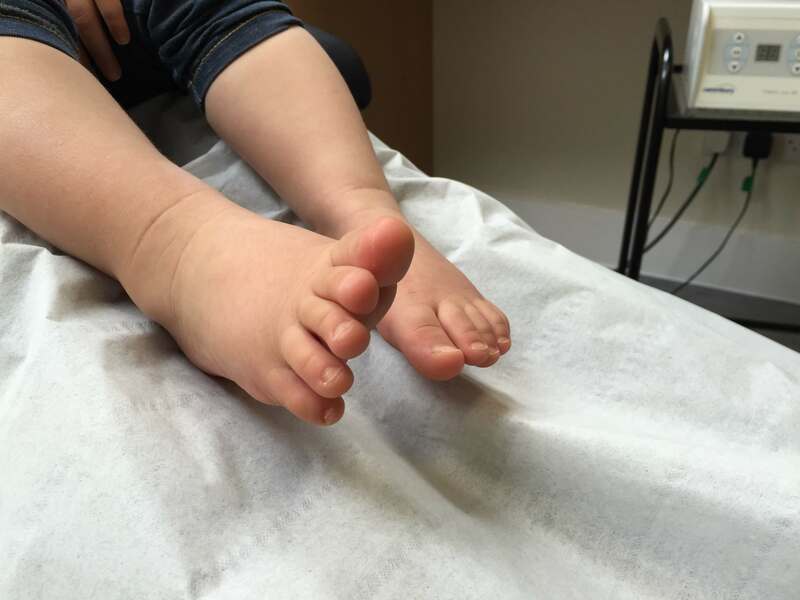 A child with any of these signs or symptoms should be promptly examined by a Podiatrist or Podiatric Surgeon for proper diagnosis and treatment. Teach your children how to trim their toenails properly. Trim toenails in a fairly straight line, don't cut down the sides and don't cut them too short. Make sure your children's shoes fit. The width of a shoe is just as important as length to allow toes to grow straight. Make sure that the widest part of the shoe matches the widest part of your child's foot. Feet can grow quickly and suddenly so check the fit of your children's shoes regularly. Don't be tempted to make small shoes last until the end of term; toe deformities can occur quickly in shoes that are too small. 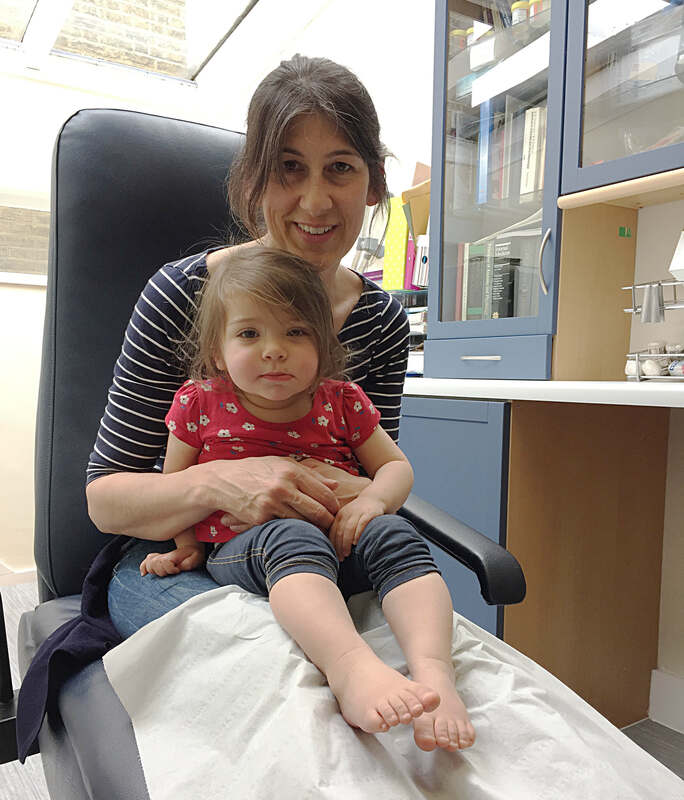 The only proper way to treat a child's ingrown toenail is with a minor surgical procedure, Book an appointment for a free assessment at Fitter Feet. Parents should never try to dig the nail out or cut it off. This type of 'home' treatment carries a high risk of infection. Our Podiatrists may supply antibiotics to children with infected ingrown toenails. Have a look at these recommendations for shoe fitting before shopping shopping for shoes to help prevent and minimize foot problems from badly fitting or worn out shoes. Children's feet can grow rapidly - even up to two sizes in six months. So make sure you account for growing when buying shoes. It's a tricky assessment because shoes that are too big can also cause problems because they allow the foot to slide forward and can damage toes and toe nails. A good fit is about a finger's width from the end of the shoe to the tip of the big toe. Tight shoes can cause blisters, corns and calluses on your child’s toes, blisters on the back of the heels or worse, ingrown nails, which can become infected. If you notice any of these problems the Podiatrist at Fitter Feet can provide treatment. Just give us a call for an appointment, or book online. Shoes lose their support and cushioning over time, so inspect new and old shoes for proper structure and arch support. Replace any shoes with wear and tear around the edges of the sole. Get worn heels repaired as a worn heel can cause ankle pains. When buying shoes, check to see that the toe box flexes easily and the shoe doesn’t bend in the middle of the sole. Worn-out shoes can cause heel pains, Achilles tendonitis and even ankle sprains and stress fractures. Children with flat feet need shoes with a wide toe box, maximum arch support and shock absorption. The best shoes to buy are oxford, lace-up shoes that have enough depth for an orthotic insert, if necessary. Girls shoes with an ankle strap and shout heels are best. Slip-on shoes or ballet style pumps squash the toes and stop foot development. They can cause bunions, and other toe deformities. It is best to avoid these styles of shoe. Parents and coaches should think twice before coaxing young, injury-prone soccer players to "play through" foot and ankle pain. Skeletally immature kids, playing sport where their feet start and stop suddenly or move from side to side on cleats can cause injury. Kids will play with lingering, foot pains that can turn out to be Stress fractures, Achilles tendonitis, heel pain, ankle sprains, broken toes. By playing through the pain they make their injury worse AND make recovery longer. If you think your child has suffered any sort of foot or ankle soccer injury book an appointment with a specialist Podiatrist at Fitter Feet right away. Children and young adults love the thrill of skateboarding. They learn to master their skills of “riding the rail” and “catching air.” But while fun, skateboarding is physically demanding and can cause serious foot and ankle injuries. These injuries range from minor bruises to open wounds or cuts and possibly to more serious foot and ankle sprains and fractures, which may require surgical repair. Boarders should be aware that the strain from repetitive, forceful motions can also cause painful foot and heel conditions such as plantar fasciitis, bone spurs and Achilles tendonitis, which may require more intensive, longer-term therapies. After any injury, take a rest from the sport and use R.I.C.E. therapy (Rest, Ice, Compression, and Elevation), which helps to reduce pain and control swelling around the injury. If symptoms persist visit Fitter Feet for a professional Podiatrist's diagnosis and treatment. Get ankle injuries treated right away. What seems like a sprain is not always a sprain. Your son or daughter might have injured cartilage or bones in the foot without knowing it. Have a qualified Podiatric Surgeon examine the injury. The sooner rehabilitation starts, the more likely long-term problems like instability or arthritis can be prevented, and the sooner your child can get back into competition. Have old sprains checked before the new school term and sport season starts. A medical check-up can reveal whether your child's previously injured ankle might be vulnerable to sprains, and if he or she might benefit from wearing a supportive ankle brace during competition. Buy the right shoe for the sport. Different sports require different shoe gear. Players shouldn't mix baseball cleats with football shoes. Children should start the season with new shoes. Old shoes can wear down like a car tire and become uneven on the bottom, causing the ankle to tilt because the foot can't lie flat. Check playing fields for dips, divots and holes. Most sports-related ankle sprains are caused by jumping and running on uneven surfaces. That's why some surgeons recommend parents walk the field, especially when children compete in non-professional settings like public parks, for spots that could catch a player's foot and throw them to the ground. Alert coaching officials to any irregularities. Encourage stretching and warm-up exercises. Calf stretches and light jogging before competition helps warm up ligaments and blood vessels, reducing the risk for ankle injuries.